Johanne Bouchard is on the Board of Leaders for “2020 Women on Boards”, and is a Member of the Board of Trustees for the American Sports Institute. 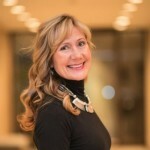 Her executive career includes CEO, CMO and Vice President roles with a variety of companies including Boss LTD, Art Technology Group, Stac Electronics and EMC Documentum, as well as Advisory Board service for a wide range of organizations. Follow her on Twitter. Next Content With Your Content?